If you’re looking at how our ancestors ate, when the foods they could grow, hunt, or forage were available, you’re looking at a very seasonal diet. For the winter months, the ketogenic diet is very similar to what we would have ate in an ancestral time, when you ate the fats, moderate protein and smaller amounts of carbs because fresh fruits and vegetables weren’t available. 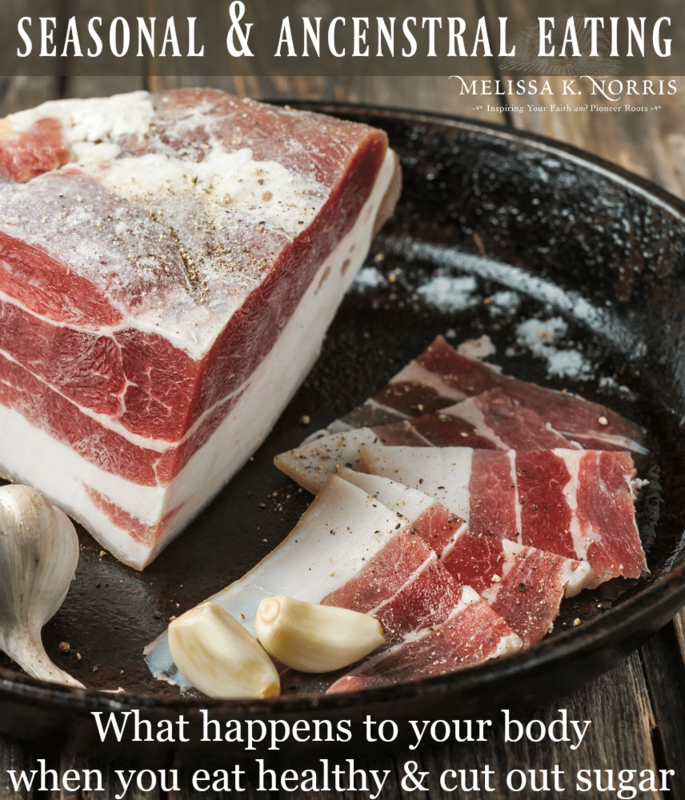 As self-sufficiency, modern homesteaders, and people who just plain care about the natural way of doing things, it’s important to understand how our foods fuel and work with or against our bodies so we can make the very best choices for us. Our genetics and lifestyle all play apart in this, including if we have health conditions already, such as hormonal imbalances, thyroid disease, diabetes, heart and cardiovascular issues, and stomach issues. The good news is, you can reverse a lot of things with your food and we’re diving in deep today with Dr. Hillary Lampers from Hunt Harvest Health and the Stealthy Hunter Podcast to find out which route is best for you. Below is episode #128 of the Pioneering Today Podcast , What Happens to Your Body When You Start to Eat Healthy & Cut Out Sugar, where we teach families how to grow, preserve and cook their own food using old-fashioned skill sets and wisdom to create a natural self-sufficient home. Dr. Hillary: What we see with the Ketogenic diet we’re re-adapting our genetics to living seasonal. A strict Keto diet is between 20 and 25 grams of carbohydrates a day, which in a modern society is very hard to do. Simple or empty carbohydrates were not around when our ancestors were pre-agriculture. We have developed so quickly as a species in many ways but our genetics are still similar to what they were thousands of years ago. Most people didn’t have access to high sugary food all year round, berries, sweet tubers, and vegetables were eaten fresh and dried to spread out through the winter. Animal fats were eaten through the winter months to keep their energy up. The brain preferrentially wants glucose before fat, which is what we’ve trained our brains to funtction off of with the modern diet, but going keto makes our genetics function in a way that makes it uses fat for energy, which is closer to our DNA. We all have genetic expressions and the way we express certain genes will affect how we do on certain diets and ways of eating. What we lean over time is some of us do really well on certain diets and some of us don’t. One, they might not be doing the diet properly. It’s important to do a lot of research with the Keto diet and make sure you understand what being in true ketosis is. But with genetic expression you could have genes that will mean you won’t do very well on a low carbohydrate diet and others will do well on a really high fat diet. Eating a life time of eating high carbs and sugars up regulates certain genes involved of sugar metabolism and fat storage and down regulates genes that involved in glycogen storage and fat burning. If you’ve been eating a life time of high carbs and sugars you’re likely to be dissappointed. Getting tested to see which genes you posses so you can eat to give your genes the support they need to avoid anything your genes would predispose you to. Dr. Hillary recommends 23andme.com health + genetic testing option. This basic math will give you a baseline, but again, remember to go by how you feel. I don’t keep my carbs as low as the 15 grams but find 25 grams a day is my sweet spot with an occasional bump up to 50 grams. If you’re a type 1 diabetic you need careful monitoring if going keto because you’re at a higher risk of developing ketoacidosis, which is dangerous and life threatening, especially if you’re symptoms aren’t being managed good. It’s recommended to only go keto with the aid of your healthcare professional. If you’re a type 2 diabetic if done correctly can be very beneficial, but you still need to be careful to monitor your numbers to avoid ketoacidosis. If you’re a poorly managed diabetic, you should avoid this, if you’re well managed and understand the numbers with the care of your medical profession it can be used. Your fat cells are very hormonally active cells. Fat cells produce thyroid hormone, estrogen, toxic by products and expresses itself with a number of different genetically variances. Your fat class are pretty smart and they’ve figured out how to survive. Once you figure out how to become a fat burner for energy (which is the basis of nutritional ketosis and the keto diet) you will, overtime, change your hormonal protocol. If you do Keto right you lose weight and you feel better. It’s the same difference with any weight loss diet, but you’re changing your body from being a fat storer to a fat burner and that changes your hormones protocol. When you decrease blood sugars and insulin, your cells work more efficiently, so your body doesn’t store the fat, it will naturally have an increase in your hormones and help balance those fat burning hormones and decrease insulin and leptin levels. Your hormone pathways are more about getting you to be a more efficient fat burner and they work together. We see estrogen dominance in almost everyone today, especially in males, which is not desirable. Estrogen is more of a natural fat storage hormone, and while we need a healthy level, too much estrogen is not desirable and your fat cells produce estrogen which creates a vicious cycle. Start reducing your sugar and carb intake now to help lesson the Keto flu symptoms. Not everyone exhibits these symptoms while others do. Remember your fat cells are beginning to be used for fuel everything that was in that fat cell comes into your blood stream. You might feel lousy for a little bit but once those items comes into your blood stream your body will eliminate it via urine, sweat, and bowel movements. Usually these symptoms will abate in 7 days. Try eating more calories from healthy fats and drinking more water. This is a comment from a reader. I started Keto about 5 months ago. I am down about 30lbs. There are days I have lot of energy, and others where I drag. I can’t find any relation between activities and sleep. I have been having more headaches lately. Would like to know if this is common with Keto. Estrogen is a natural constipator and if you start Keto you may notice you’re constipated. Add in more fiber vegetables and a fiber supplement if needed. If you’re not used to eating a lot of vegetables, it can take your stomach a while to adjust. Drink plenty of water and make sure you’re moving, exercise helps your digestion. Mix together, store in fridge, and drink it up! Yes, if you’re running and training and have been doing it for awhile and your body is used to it, then using ketogenesis can be a great tool to burn more fat. But be careful with excessive endurance. You’ll want to watch your protein because protein can increase glucose but with training it can be a very efficient way to train. And also using the keto diet with polymyalgia rhumatica aka pmr, is joint pain. It’s usually in different joints and in association with headaches. If you have this condition, pain and stiffness, and lack of appetite and anemia. You need to know your numbers and if you’re not eating enough if can be hard to get into ketosis if you’re not used to eating that much fat. In the long term it can help especially with the fatigue and inflammation, but it can be hard to get over the initial hump. Does keto raise your cholesterol levels? Dr. Hillary “We know fat is an essential part of our hormonal levels. Fat and cholesterol levels are different. If you’re eating saturated fat it takes a lot of energy for your body to burn these up and they can cause more inflammation. Eating saturated fat every night is not good for your heart. You need to understand cholesterol and its role in the body. We’re seeing evaluated cholesterol levels because people are eating too many sugars and simple carbs. In the 1940’s and 50’s we ate organ meats and meats that were high in fat and cholesterol but they were high in essential nutrients like folates and B vitamins that we need to support genetics and metabolic behavior. You rarely heard of cardiovascular disease and diabetes. This was villainized by the sugar industry and high fat was toted as bad, we were told margarine was good instead of butter. Now we have more cardiovascular disease than ever and using statin drugs at alarming rates. Returning to higher fats and higher nutrients from organ meats and leafy greens we’d see a lot less heart disease.